In light of comments by Democratic strategist Hilary Rosen, readers are discussing if the Romneys can relate to average folks. Overheard on CNN.com: Can the Romneys relate to the average family? Democratic strategist Hilary Rosen has apologized for comments about Ann Romney, whom she said "never worked a day in her life" as a stay-at-home mother. "Mommy wars" and women's issues have taken center stage. 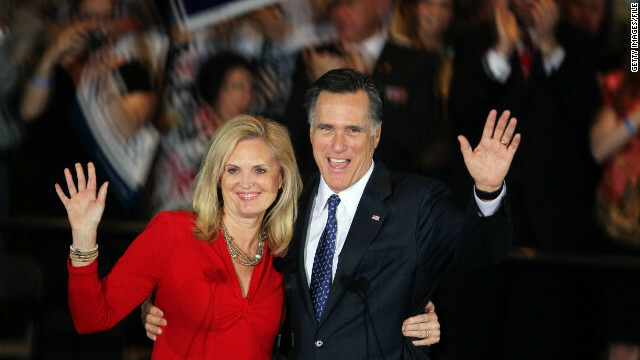 Readers discussed whether the Romneys can relate to moms and families. The most-liked comment on the story agreed with Rosen. DrMAH: "(Rosen is) absolutely right. The ultra-rich Romneys have no idea what the rest of us go through, and Mitt has made it clear that he has no interest in finding out. She's not qualified to speak about women's concerns. LOTS of us struggle with illness, get degrees, and raise kids, but almost NONE of us have an army of domestic servants to do all the heavy lifting while we work on our dressage." Some of the responses talked about the Romneys' inexpensive basement apartment during their undergraduate years. brianwaz: "They lived in a $50-a-month basement apartment at the start of their marriage (with a baby). Try using facts next time." nullcodes: "Though he lived in a basement apartment, his dad who was a governor could have saved him from any real financial or other messes." After neighborhood watch volunteer George Zimmerman was charged Wednesday with second-degree murder in the February shooting death of Florida teenager Trayvon Martin, the teen’s mother said she finally got what she asked for. “Thank God. We simply wanted an arrest," Sybrina Fulton told reporters shortly after the charge was announced. "We wanted nothing more and nothing less, and we got it." Fulton’s comments were among a wide range of reactions from people across the country who advocated for the arrest of Zimmerman, the 28-year-old man who claimed self-defense in Martin’s shooting and wasn’t charged until a special prosecutor’s review of the case. The Rev. Al Sharpton, who advocated for Martin’s arrest, said Wednesday that "there should be no high-fiving" over Zimmerman's charge. But he lauded the public pressure that he said caused Florida’s governor to order a prosecutor to review the case. "If we did not get this far, we would condemn them," Sharpton said. "We must say that despite the fact that we are of ... different political persuasions ... we came together and said only the facts should matter." 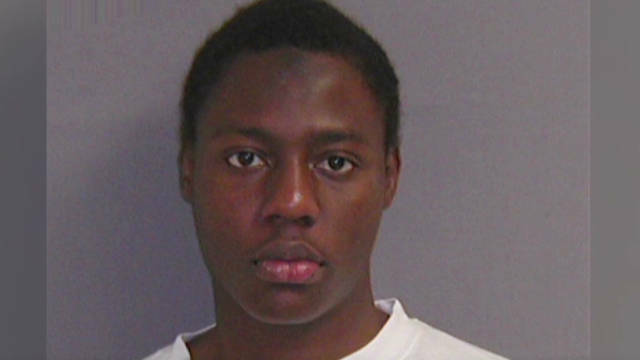 Umar Farouk AbdulMutallab was sentenced to life in prison in February. Umar Farouk AbdulMutallab, dubbed the "underwear bomber" after he was convicted of trying to bring down an airliner with a bomb concealed in his undergarments, has been moved to the federal Bureau of Prison's "Supermax" facility in Colorado, the agency said Thursday. Bureau of Prisons official Edmond Ross would not comment on why AbdulMutallab was moved from the U.S. Penitentiary in Florence, Colorado, to the ultra-high-security Supermax facility in the same city. AbdulMutallab, 25, pleaded guilty in October to attempted use of a weapon of mass destruction, among other charges, in trying to bring down a Northwest Airlines flight on Christmas Day 2009. He was sentenced to life in prison in February. U.S. officials say the terror group al Qaeda in the Arabian Peninsula helped plot the bombing attempt on Northwest Airlines Flight 253, which was heading from the Netherlands to Detroit. Authorities say AbdulMutallab, a passenger, tried to ignite a bomb that was hidden in his underwear shortly before the plane landed, but passengers and flight crew members subdued him and extinguished flames that erupted when the device briefly set his clothing on fire. The plane was carrying 289 people. "As this investigation and prosecution have shown, Umar Farouk AbdulMutallab is a remorseless terrorist who believes it is his duty to kill Americans," U.S. Attorney General Eric Holder said in a Justice Department news release after the sentencing. At the Supermax facility, AbdulMutallab joins Ramzi Yousef, leader of the 1993 World Trade Center bombing, so-called "shoe bomber" Richard Reid, Atlanta Olympic Park bomber Eric Rudolph and "Unabomber" Ted Kaczynski among an inmate population of more than 450. [Updated at 2:01 p.m. ET] A solemn George Zimmerman, wearing gray jail coveralls, appeared before a Seminole County, Florida, judge Thursday, speaking only a few words as his arraignment was set for next month. All matters including bond and further motions in the case will be handled by the circuit court, Judge Mark Herr said. The case will be assigned to Judge Jessica Recksiedler going forward. As the short hearing was concluding, Zimmerman's attorney, Mark O'Mara, asked that records containing personal information on witnesses, including addresses and telephone numbers in some cases, be sealed. As nothing else besides the probable cause affidavit had been filed in court Thursday, Herr said Recksiedler will address a motion to seal the file. O'Mara did not ask that Zimmerman be released on bond, although he said earlier in the day he wanted his client released as soon as possible. He did note, however, that being out on bail could jeopardize Zimmerman's safety. "I think nobody would deny the fact if George Zimmerman is walking down the street today, he would be at risk," he explained. 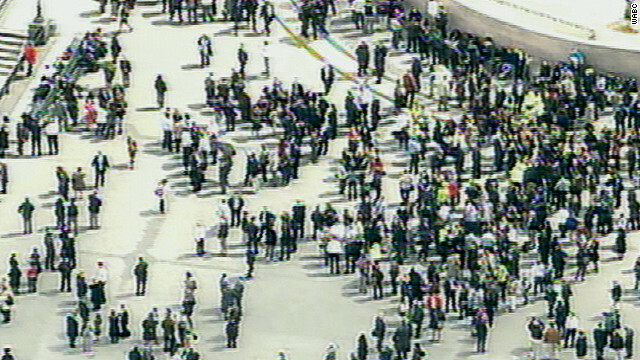 People stand outside Two World Trade Center in lower Manhattan after the building was evacuated Thursday. [Updated at 12:26 p.m. ET] Police say a package containing a novelty or inert grenade was responsible for the evacuation at the Two World Financial Center in lower Manhattan Thursday. Police Sgt. Brendan Ryan told CNN that authorities have given the "all clear," after a bomb squad investigated the incident. [Updated at 12:19 p.m. ET] A Manhattan skyscraper has been evacuated as New York police investigate a suspicious package in the building, authorities said Thursday. Police say a bomb squad is at the scene at Two World Financial Center, which is located across the street from One World Trade Center, the site of the World Trade Center that was the scene of the September 11, 2001, terror attacks. The package was flagged in the building's mail room at 10:53 a.m. when it was scanned, said police spokeswoman Kim Royster. The building's security personnel initiated the evacuation about seven minutes later, she said. Royster said the item resembled an explosive device, though it's not known yet exactly what it is. Crowds have gathered near the building. George Zimmerman faces a second-degree murder charge in the killing of Trayvon Martin - a charge of such magnitude that bail is usually not granted, a Florida legal expert said Thursday. "It's uncommon, but not unheard of," to grant bail in such cases, said Charles Rose, director of the center for excellence and advocacy at the Stetson University College of Law in Gulfport, Florida. Any bail would be large and need a significant financial requirement, whether in money or property, from Zimmerman or his supporters, Rose said. "The judge will have to hit the range for what is appropriate in cases like this," he said, possibly around $250,000. The magistrate judge hearing Zimmerman's case Thursday will consider Zimmerman's character, his likelihood to make subsequent court appearances, and his ties to the community when deciding whether to grant bail, Rose said. The law professor said he didn't think Zimmerman posed a flight risk as he's become so recognizable through media coverage of the case that he'd be spotted almost anywhere. Stuntmen participate in an unusual ad campaign in Belgium. Every once in a while, an ad campaign is so creative or unusual that it stands out from all the other commercials we're bombarded with every day. A lot of times these cool ads go viral, such as one fun promotion in Belgium that caught our eye. You've Gotta Watch these memorable ad stunts. These unidentified flying objects puzzled onlookers in Manhattan. An unusual campaign for a movie featured flying “people.” Watch them buzz around the Statue of Liberty and other New York landmarks. It’s a bird! It’s a plane! These unidentified flying objects puzzled onlookers in Manhattan. An unusual campaign for a movie featured flying “people.” Watch them buzz around the Statue of Liberty and other New York landmarks. At an ad shoot for Gillette, tennis star Roger Federer knocked a ball off of a staffer’s head while displaying his serve. This got a lot of people wondering if it’s real. Watch the incredible shot and decide for yourself. At an ad shoot for Gillette, tennis star Roger Federer knocked a ball off of a staffer’s head while displaying his powerful serve. This close shave got a lot of people wondering if it’s real. Watch the incredible shot and decide for yourself. CNN.com Live is your home for all the latest news on the Trayvon Martin shooting and aftermath. 11:00 am ET - Indiana State Fair stage collapse briefing - Two independent groups will release their findings into last year's fatal stage collapse before a Sugarland concert at the Indiana State Fair. At 3:00 pm ET, the members of Sugarland will answer lawyers' questions at a deposition regarding the collapse. Filed under: Crime • Indiana • Justice • On CNN.com today • Trayvon Martin • U.S.
John Edwards speaks to reporters on June 3, 2011 in Winston Salem, North Carolina. 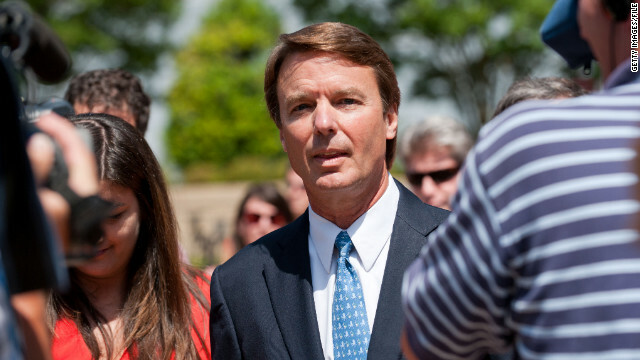 Jury selection begins in a Greensboro, North Carolina, federal courtroom Thursday in the trial of 2008 Democratic presidential candidate John Edwards. Edwards is charged with six felony and misdemeanor counts related to the money dealings of his failed 2008 campaign. Rielle Hunter, his former mistress, is expected to testify at the trial. A major issue in the approaching trial is whether money given to support Hunter, by the then-candidate's benefactors should have been considered donations toward his presidential campaign. Edwards maintains the money was a gift. Edwards is accused of conspiracy, issuing false statements and violating campaign contribution laws. He denies any wrongdoing. If convicted on all counts, Edwards could face 30 years in prison and a fine of up to $1.5 million. A cease-fire deadline passed early Thursday without reports of major attacks in Syria, opposition activists said, prompting dim hopes the warring sides will silence their guns and end more than a year of bloodshed. A peace plan by international envoy Kofi Annan set a 6 a.m. deadline (11 p.m. ET Wednesday) for government forces and opposition fighters to end the violence that has killed thousands. In the flashpoint city of Homs, activist Abu Salah reported no explosions or shelling since the deadline passed. "Interestingly, we have been only hearing the sounds of birds," he said. "However, we have seen the security forces on alert." Connecticut's governor says he will sign a bill abolishing the death penalty, making it the 17th state to abandon capital punishment. On Wednesday night, lawmakers in Connecticut's House of Representatives passed the bill by a vote of 86-63. The state Senate approved it last week. "I'm pleased the House passed the bill, and when it gets to my desk I will sign it," said Gov. Dannel Malloy, a Democrat. "When I sign this bill, Connecticut will join 16 other states and almost every other industrialized nation in moving toward what I believe is better public policy." Malloy did not say when his office will receive the bill. The first opportunity for North Korea to launch its controversial rocket passed uneventfully Thursday, keeping the region on tenterhooks for at least another day. As the launch window opened Thursday morning, the reclusive, nuclear-armed regime's neighbors were nervously watching for developments from the launch site, which is in a remote area in the northwest of the country. Japanese missile defense systems scanned the skies above Tokyo and Okinawa. Japan has threatened to shoot down the North Korean rocket if it is seen threatening its territory. International journalists in Pyongyang were taken on an official visit to a conference that had no connection to the launch. North Korean state television made no mention of the rocket, which the country says is necessary to put a weather satellite in orbit. North Korea has said that it plans to carry out the launch sometime between Thursday and Monday, between the hours of 7 a.m. and noon (6 p.m.-11 p.m. ET Wednesday-Sunday). Venezuelan President Hugo Chavez has spent 38 days in Havana since the beginning of the year. 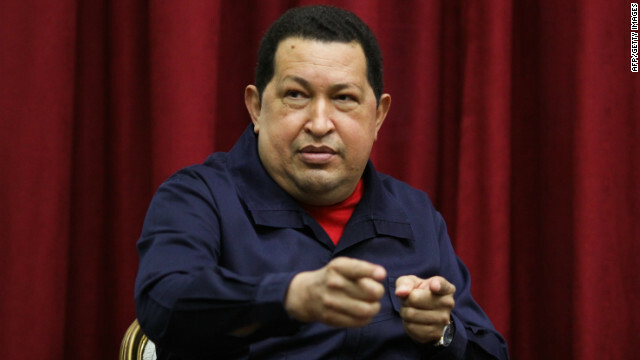 President Hugo Chavez returned home to Venezuela late Wednesday after his latest round of cancer treatment in Cuba. The Venezuelan leader greeted well-wishers at an airport in Caracas, waving, shaking hands and kissing some on the cheek before he was whisked away to the Miraflores presidential palace. Unlike his previous arrivals from Cuba, Chavez didn't spend time on the tarmac answering questions at length. His return to Venezuela comes as the country marks the anniversary of a 2002 coup that briefly removed Chavez from power. The state-run AVN news agency reported that he was expected to take part in events commemorating the failed coup.